The 3rd edition of the Painting with Light Festival, Lana Lights, concluded on 26th April 2015. Projections, multivision, photography, video, music, poetry, graphic design and live performance were the ingredients for this weekend event. There were approximately 700 visitors over the three days, with the most popular event being “Watch this space…” at Zuegg, on Sunday 26th April. RESONANTIA – The Anatomy of a Building – Lana Lights 2015 from Alex Rowbotham on Vimeo. There was an informal presentation “How did you do that?” which discussed some of the technical production process of creating a building projection, with this Luce Dipinta hopes to encourage more people to create their own. Collaborating with WerkBank and Jugenzentrum JUX – in creating a youth workshop. 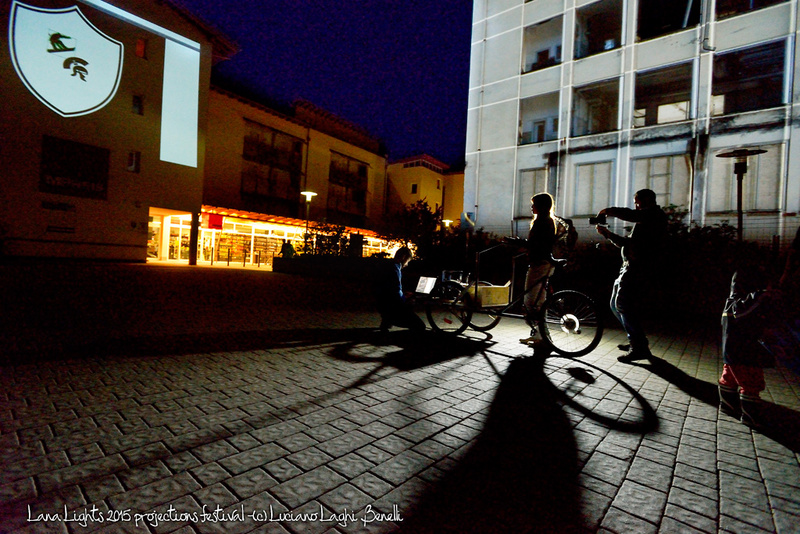 Recycling gurus Basurama, from Spain, created a bicycle capable of carrying a projector with power and an audio system, a Bicinecleta or a ‘mobile cinema’. The group presented this along with projections during the final day of the festival on the streets of Lana. Coinciding with one of the architectural projections was a photographic exhibition of the same name, “Street / Straight into Camera” by Ferdinando Fasolo, this is being displayed in the Oberwirt Lana restaurant which also played host to the festival dinners each evening. The exhibition will continue until the end of June 2015. This year’s edition of the event was ticket-less, free for everyone to come and enjoy. Young and old there was something for everyone. We had a little rain on the final evening during the presentation of Resonantia, however this did not prevent people from coming. It was a wonderful event for everybody who comes. And some more video from Lana Lights 2015! Thanks for such a wonderful mapping festival! via Lana Lights 2015 official site.